Leonard Nimoy made what has been touted as his “final convention appearance” on Sunday in Chicago at the final stop of Creation Entertainment’s Official Star Trek Convention which is celebrating the 45th anniversary of the franchise. 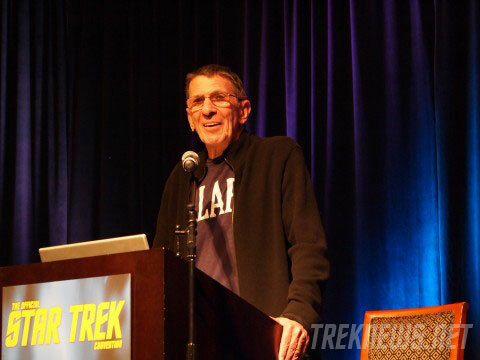 Back in July, Nimoy announced that he would be retiring from the convention scene this year, listing the annual Las Vegas convention in August, followed by Chicago this past weekend as his final appearances. In addition to Nimoy, the weekend’s festivities included on stage appearances from a myriad of other Star Trek actors and personalities, including Brent Spiner, Jonathan Frakes, Nichelle Nichols, John de Lancie, Dominic Keating, Connor Trinneer, Nana Visitor, Rene Auberjonis, Brannon Braga, TrekNews.net’s own John Tenuto and more. Inside the Grand Ballroom of the Westin O’Hare Hotel, Creation co-founder Adam Malin presented an emotional video tribute, a pre-recorded video farewell from director J.J. Abrams, and Bruno Mars’ “Lazy Song” music video, in which Nimoy stars. 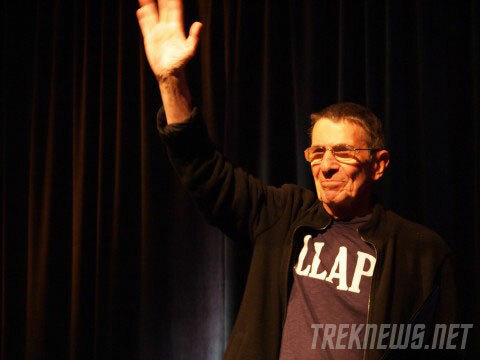 Around 2 PM, Nimoy made his way on stage to a standing ovation and thunderous applause. 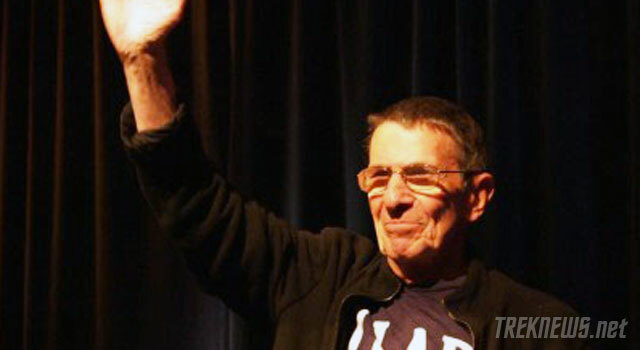 Similar to his presentation at this year’s Las Vegas Star Trek Convention, Nimoy presented a retrospective on his career, discussing his life and career through images, poems and narrative. Nimoy discussed growing up in Boston, moving to Los Angeles, his early work in Hollywood and being cast in Star Trek. 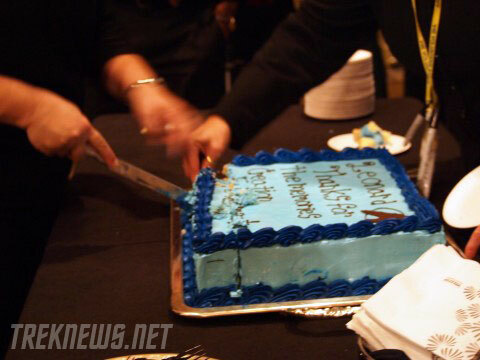 Following the heart-felt presentation, Nimoy held up the Vulcan salute, wishing all the fans “Live Long and Prosper.” He was then presented with a cake, which he shared with the audience.